Three matches of varied, but equally entertaining, styles were the order of the day as the OFC U-19 Women’s Championship got underway at Ngahue Reserve today with wins to New Zealand, Fiji and New Caledonia. 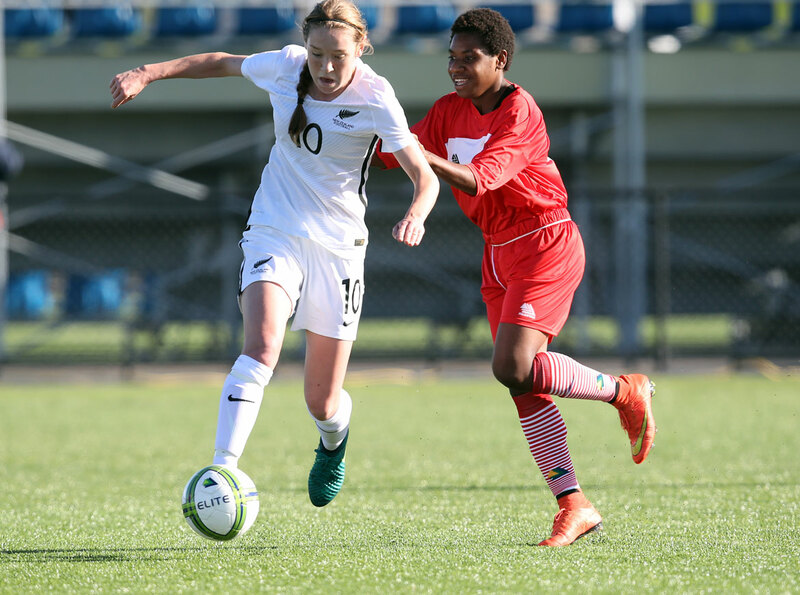 It was goals galore for New Zealand as they downed FIFA U-20 Women’s World Cup 2016 hosts Papua New Guinea 12-0 in the day’s opener. A well-drilled Fiji side then secured a 4-0 win over Tonga before a tightly fought contest between New Caledonia and Samoa resulted in a 1-0 win for the Francophone side. New Zealand coach Gareth Turnbull was pleased to get the result and some goals under the belt on the opening day. “In all reality the first half performance was poor from the standards we demand of future Football Ferns,” he said. “But credit to them, we spoke through some things pretty honestly at half-time and came out and executed what we asked them to do. Despite taking on the might of tournament favourites and defending champions New Zealand first up, Papua New Guinea started well, keeping an experienced New Zealand squad at bay for the first 15 minutes. Between the posts for Papua New Guinea was Faith Kasiray who did well to keep a flurry of shots from the likes of Samantha Tawharu, Hannah Blake and Jacqui Hand from the back of her net. However on the stroke of the 16th minute New Zealand took the lead through Blake who followed up an attempt off a corner to open the scoring. Less than 15 minutes later and the Kiwis had their second as Tawharu put a neat finish past Kasiray. Ramona Padio, a senior international for Papua New Guinea, was a crucial member of the squad, controlling from the centre especially when in possession, however she often struggled to connect with her teammates in order to really put pressure on their opponents. Two quick-fire strike in additional time of the first half from Hand and Blake gave New Zealand a 4-0 lead going into the break. New Zealand wasted little time getting back into the swing of things in the second half as a goal to substitute Dayna Stevens was closely followed by one from Emma Main. The pair then added another one apiece with goals in the 64th and 66th minutes. Stevens was the first to a hat-trick when she netted New Zealand’s ninth, before Blake took the side to 11 unanswered goals after scoring two consecutive goals as regulation time wound down. Tawharu’s brace came from the penalty spot in the fifth minute of additional time as New Zealand wrapped up a 12-0 victory. Papua New Guinea coach Rachel Wadunah was impressed by the attitude of her side as they refused to give up despite the accumulating goal tally. “They did the best they could, despite conceding goals,” she stated. “New Zealand were very fast on the ball. There were times when they would play behind our defenders and we weren’t able to handle them. The second encounter of the day saw an organised Fiji side applying pressure on Tonga and forcing errors they could use to their advantage. The powerful presence of Cema Nasau and Timaima Vuniyayawa up front kept the Tonga defence on their toes, and Fifi Moala did well as the last defender to keep them from getting off too many shots. A handball in the area by a Tongan defender was the opening Fiji needed and Nassau was accurate from the penalty spot as she placed the ball out of Mele Akolo’s reach. Before the end of the half Fiji had added a second courtesy of captain Luisa Tamanitoakula. Tonga saw some moments of brilliance especially on the counter-attack with Carmel Uhila showing herself off as an emerging talent, while Seini Lutu’s experience was evident in her accuracy and timing. However Fiji proved a touch more organised in their execution and come the 56th minute another foul in the Tonga penalty area had the referee Rani Perry pointing to the spot for the second time in the match. This time it was captain Tamanitoakula putting it past a diving Akolo before Nasau sealed the win in the 65th minute with a fine strike earning her a brace. Tonga coach Christian Koaneti admitted his side wasn’t as organised as their opponents and it showed in final result. “All credit goes to Saroj (Kumar) and his girls,” Koaneti said. “We tried to play according to what we planned, but it didn’t work out that way. I think during the match Fiji was much better ahead. Kumar was impressed with the display from his side and the way they into practice what had been discussed in training. “They played according to what we have been doing in training, and it was good that they maintained their confidence throughout the game,” he said. New Caledonia made an impressive start to their campaign as the side saw off Samoa 1-0 in a heated exchange at Ngahue Reserve in Auckland. While Samoa seemed to continually be launching attacks from all over the field in the first half, New Caledonia made the most of what they had and put a high pressure attacking mentality to good use. Clinical tackling and pressing high on the ball in packs, New Caledonia were able to disrupt the Samoan passing game. In the 52nd minute, Alice Wenessia slotted the ball into the top right corner of the net after a well-placed corner ball was delivered by Oceane Forest. The final ten minutes saw Samoa up the pressure with a bombardment of the New Caledonian defence but the central defenders held them off to retain the 1-0 lead at the final whistle. New Caledonia coach Kamali Fitialeata said an opening win in the competition was nice, especially after the results of his side’s previous outing in this age group which included a 6-2 loss to Samoa in 2015. “We’re happy to get a win here because the Samoan team posed a lot of problems for us, not just physically but tactically too. Martin Tamasese said his charges should be disappointed they weren’t able to get something from the match after an impressive display. “It was disappointing, but I thank the girls for the game today as they played well,” he said. The OFC U-19 Women’s Championship will pick up again on Friday 14 July with another three enticing encounters scheduled at Ngahue Reserve in Auckland.